Merry (almost!) Christmas from our family at MidModMich! Last year we were working on the house, and this year we're living here - what a HUGE different a year makes. I've been seeing other bloggers share their retro-tastic Christmas decor with everyone, and while we do not have a collection of anything retro for the holidays (yet!!! 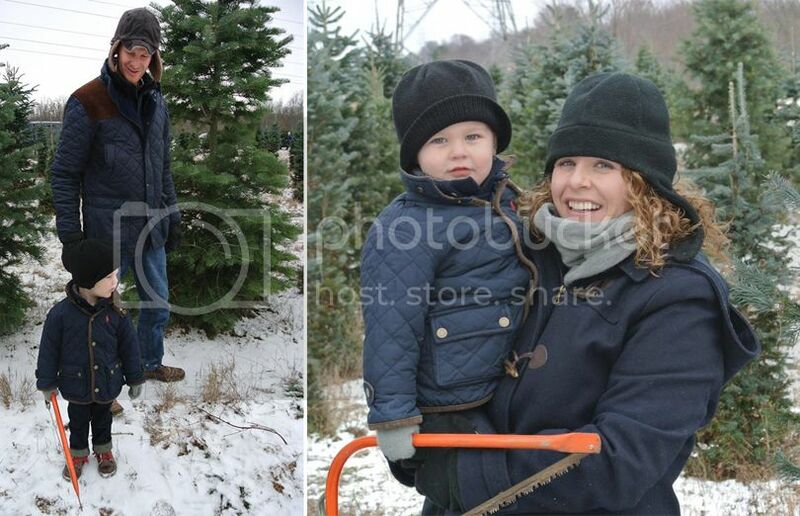 ), we did get ourselves a tree at the farm we've been visiting for the past five or six years! While our plans to go the first Sunday of December didn't work because of a busted fitting on our well in the basement and 2" of standing water in the storage room, we did get to the tree farm the second Sunday of the month. There weren't as many trees available as in previous years, so our options were limited, but we found a perfect fit for our living room. Eames was quite excited Greg allowed him to hold the saw. He was less excited about the freezing cold weather! I've been collecting Old World Christmas ornaments since I was a little girl. My grandmother started the collection slowly, and while she doesn't give us an ornament anymore, I usually take the Christmas money she gives us and add to my collection. This year, I feel like I had enough ornaments to not add any additional ones to the tree! We have 1000 white lights on it, and at night, this baby glows. I love it. 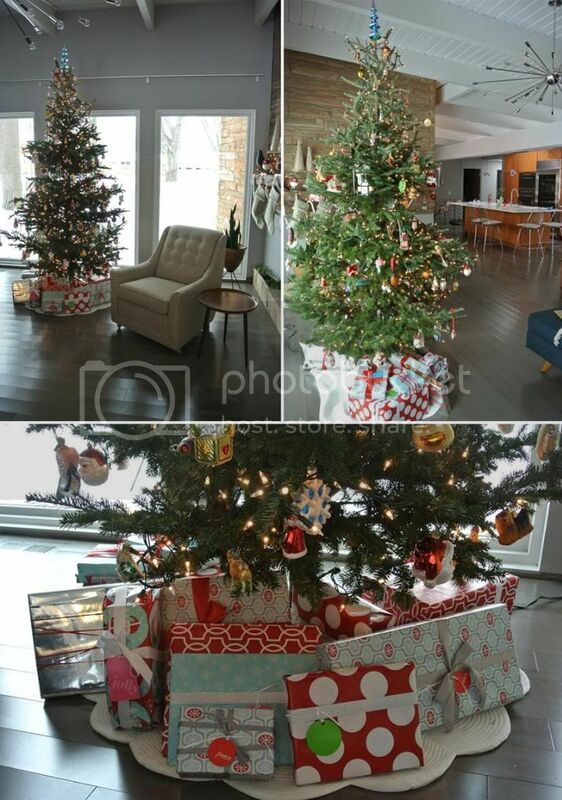 I also love the collection of graphic wrapping paper I used for the gifts. Most of it I had on hand from previous years, but I did add a couple, and love how it all ties together perfectly. I'm a sucker for ribbons and bows and cute name tags, so seeing all the gifts to our family members makes me happy! There are a few in the pile for Eames, but somehow I've convinced him otherwise and he hasn't touched a thing! Our front entry is quite festive as well. I picked up the cute wreath from Target, and had a half-dead string of lights that worked perfectly around the plant corner in the dining room. 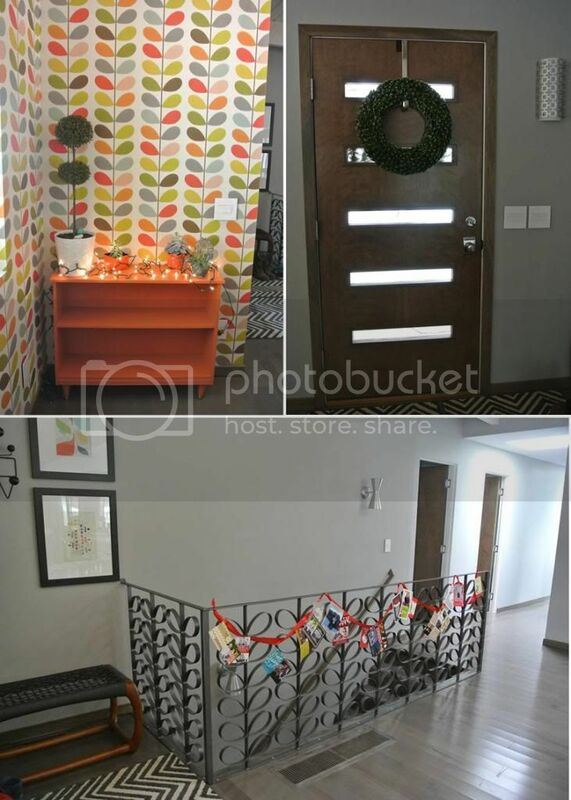 I had the idea to string a ribbon through out railing to hang out\r holiday cards - the ribbon is almost covered with cards now! That's about it from here! We are getting excited for hosting Christmas Eve with our families and New Year's Eve with our friends, plus a couple of other friends are coming over for dinner in between those. We are very thankful our home is a good spot to gather, and have been having such a great time hosting since we moved in.